The last time we reviewed an Anker bluetooth speaker was back in January, when we reviewed the Soundcore Boost. We’ve been given another opportunity to review a bluetooth speaker from the same company. This one has an LED light party and 360 degree sound. We’re reviewing the Soundcore Flare+. The Flare+ has a playtime of up to 20 hours. This is up from the playtime of the original Flare speakers of 12 hours. That’s some impressive time without having to charge! Also helpful is the ability to charge your phone through the speaker. It also is a bit taller and wider, plus it has two extra tweeters over the original. The sound quality is even more superior than the high-rated original. Another difference is the built in Alexa and the ability to use the speaker as a power bank. What Comes in the Soundcore Flare+ Package? How is set-up? The Soundcore Flare+ device and the micro USB Cable are included in the box, as well as the instruction book. The Soundcore app can be downloaded from the App Store or Google Play. Once downloaded, the app is easy to connect and manages the Flare Plus with ease. There are 5 color themes and 5 adjustable patterns that gives a fun vibe with the beat of your music. This all can be controlled by the app as well. Bluetooth 5.0 makes these super easy to pair with your phone. 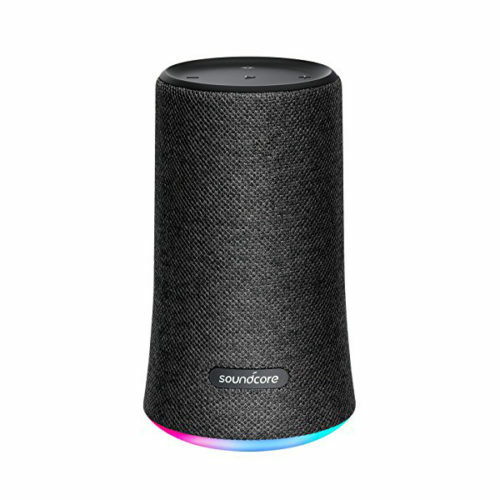 These speakers are able to pair with other Soundcore Flare speakers, so you can use them in matched playing mode to increase the sound in the room. You can also adjust them as left and right speakers to give a dynamic surround sound as well. The BassUp technology intensifies your experience in the bass end of your music. At $99, the price is right for this great speaker. The sound is great, and these speakers have received a high rating of 4.7 out of 5 stars on Amazon.com. I encourage you to check it out for yourself! Thanks to Anker for sending us this product for free in exchange for our fair and unbiased review. No other compensation has been given.